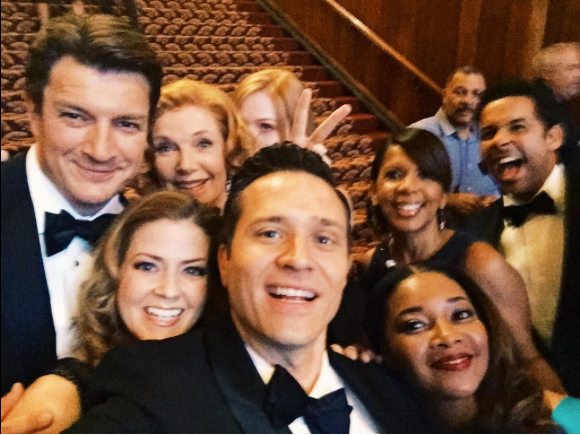 Monday night was the season finale of Castle, and star Nathan Fillion was live-tweeting the big episode. He had a slew of hilarious tweets, including the one above; he also shared a group selfie of the cast from filming the finale. Castle just recently got renewed for another season, so this finale was written as if it could possibly be the last episode ever. The result was a wonderful episode full of suspense, a scary murder investigation, and a great moment at the end with the entire cast gathered together. Nathan’s tweets and the episode are definitely worth watching. The news broke that American Idol will end after its next season. 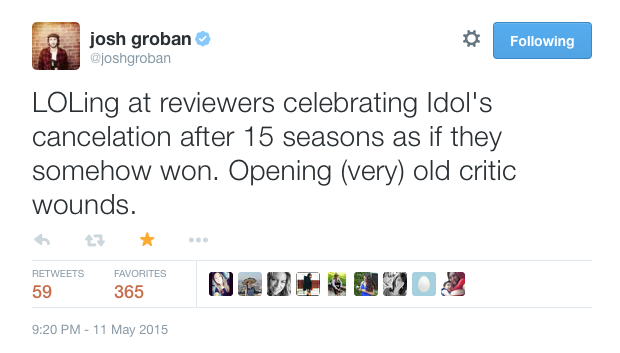 Josh Groban, who has performed on the show multiple times before, made a hilarious tweet about critics of the show celebrating this “cancellation.” After fifteen years on the air, Idol has definitely made a name for itself. This past week there was a lot of news about cancelled shows; networks seemingly went on a killing spree. Some other shows cancelled include Backstrom, Forever, and Revenge (which just ended Sunday night). Just when you thought it was over, Deflategate is back in the news again. In case you don’t know, months ago it was discovered that the Patriots’ footballs had been slightly deflated, giving them an advantage in that game. The team and coaches had claimed to know nothing about the incident, assuming someone snuck into the locker room and damaged the footballs. After an investigation, though, the blame seems to be placed on quarterback Tom Brady. He has been suspended for four games in the upcoming season, while further investigation is pending. Brady and the team are very upset about this, still denying involvement. Either way, the whole situation is pretty funny, especially with people like Rainn Wilson cracking jokes about the team. 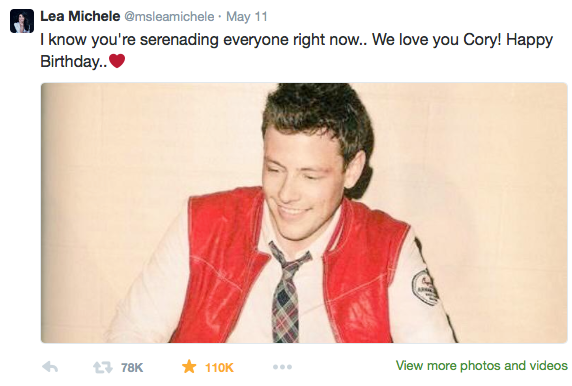 And finally, on a somber note, this past Monday was Cory Monteith’s birthday. 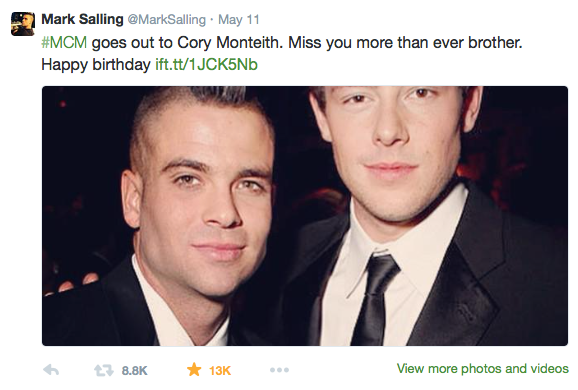 The Glee star died of a drug overdose two years ago, and co-stars Mark Salling and Lea Michele (Monteith’s girlfriend at the time) wished him a happy birthday on Twitter. The messages were beautiful and heartfelt, surely meaning a lot to friends, family, and fans of Cory. How about that episode of Castle?! And what are your thoughts on Deflategate? Let us know in the comments or tweet us using #glamorouspaper!